H&N Perry would like to congratulate Clement & Pamela White. Just for having their investment property managed by H&N Perry, Mr & Mrs White have won a Luxe Package at Crown Perth. This includes an evening’s accommodation at the Crown Metropol with entry to the resort pool and breakfast for two people. H&N Perry understand that our Property Owners are our most valuable asset. We value their continued custom and like to reward them with promotions such as this one. How much rent will my property realistically achieve? How can I be sure I’m getting the best tenant? How can I get my property tenanted faster? What happens if my tenant falls into arrears? Call Suey today on 9535 1822 and see what H&N Perry real estate agency can do for you. H&N Perry would like to thank our Landlords for their continued loyalty by offering them the chance to win a night at Crown Perth. Our Property Managers work hard to achieve the maximum possible rental income with the least amount of hassle for our property owners. Using state of the art computer programs, we find pre-approved, quality tenants and supply our owners with Inspection Reports complete with photographs and Owner’s Statements – all delivered promptly by email. 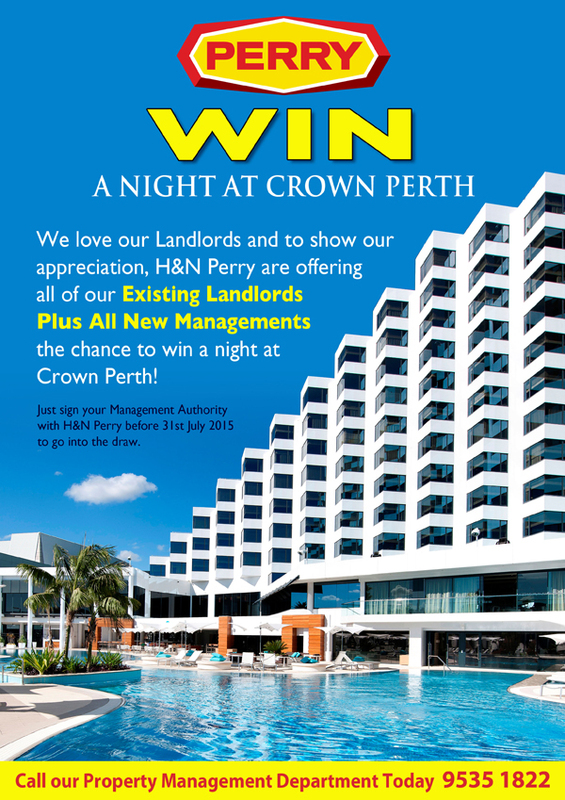 To show our appreciation to all of our Landlords, both residential and commercial, H&N Perry are putting you into the draw to win a night at Crown Perth. All new Management Authorities that are signed before 31st July 2016 will also go into the draw. You will receive one entry for every property that we manage, so the more properties that you have managed by H&N Perry, the more chances you’ll have to win! The lucky winner will enjoy an evening at Crown Perth, renowned for its casino, world class restaurants, nightclub and theatres. Is your Property Manager doing the best job for you? 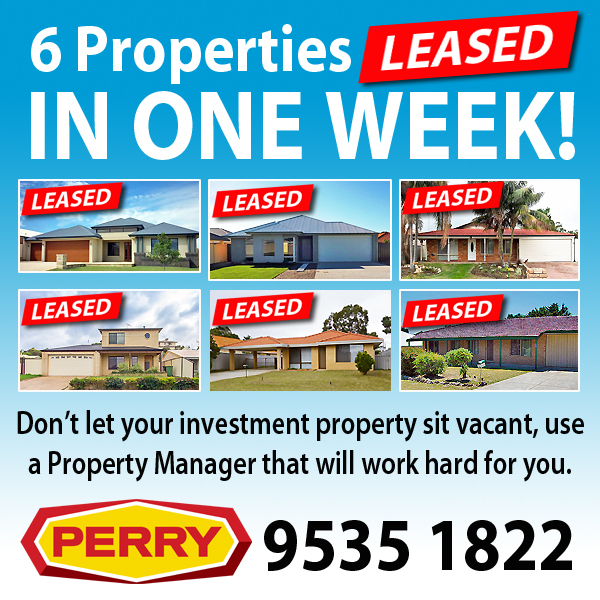 H&N Perry are Mandurah’s leading office in residential and commercial property management. For more information on how H&N Perry can help you manage your investment, call Jan Wiley on 9535 1822 or call into our waterfront office at 54 Mandurah Terrace, Mandurah. Did you know that H&N Perry have been so successful in filling our residential houses for lease that we now only have have 5 vacant properties left! That’s right – while other agencies are struggling with high vacancy rates and idle listings, H&N Perry are actively finding quality tenants to occupy your investment property and pay you rent. Our designated leasing officers use the latest technology to identify desirable tenants and arrange private property inspections. In fact, our residential leasing department have secured 6 new leases this week alone! H&N Perry have experienced Property Managers that cover houses for rent in all areas of Mandurah including Dawesville, Wannanup, Falcon, Erskine, Halls Head, Dudley Park, Greenfields, Silver Sands, San Remo, Meadow Springs, Lakelands and Madora Bay. Don’t let your investment property sit idle, with an H&N Perry designated leasing officer – properties don’t stay vacant for long! Call our rental department for an appraisal on your property today – 9535 1822. Landlords Are Winners at H&N Perry! H&N Perry would like to thank our Landlords for their continued loyalty by offering them the chance to win! To show our appreciation, all of our Landlords, both residential and commercial will be put into the draw to win a night at Crown Perth Metropol. Any new management authorities that are signed before 31st July 2014 will also go into the draw. The lucky winner will enjoy an evening at Crown Perth, renowned for its casino, world class restaurants, nightclub and theatres. Our Property Managers are always working for our Landlords to achieve the maximum possible rental income. Using state of the art computer programming and technology, we can provide our owners with pre-approved, quality tenants as well as Inspection Reports complete with photographs, and Owner’s Statements – all delivered promptly by email. For more information on how H&N Perry can help you manage your investment, call Jan Wiley on 9535 1822 or call into our waterfront office at 54 Mandurah Terrace, Mandurah.